On March 17, 2013, Alison Redford’s PC government broke the back of justice…and none of us saw it coming. 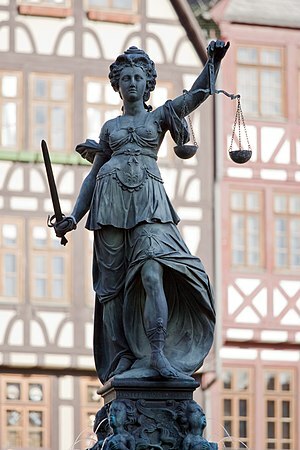 Lady Justice, or Justitia, is the personification of the justice system. Her blindfold symbolizes objectivity, her scales symbolize the balance between truth and fairness and her double-edged sword demonstrates that reason and justice that can be wielded for or against a party. But this isn’t enough for Ms Redford and her justice minister, Mr Denis. They’ve saddled Justitia with a new prop—an empty sack—which the goddess must now fill with money. The only way Justitia can fill the sack is to throw away her scales and double-edged sword. But she’d better keep her blindfold. She won’t want to see the injustice that will be perpetrated in the name of “streamlining” the administration of justice and ”rehabilitating” less dangerous offenders. At this point you’re thinking; Ms Soapbox has well and truly lost it. But stick with me and I’ll walk you through this. “One Free Crime” Or A Gross Miscarriage of Justice? Yes, the Wildrose “One Free Crime” coupons were extreme (ya think?) and yes, the PCs demanded an apology, but there’s no getting around the fact that the PCs are pushing a plan not to prosecute first and second time offenders who commit “less serious” crimes. Okay, let’s talk shoplifting. Shoplifting is a criminal offence, it’s not a traffic violation. If the accused, say a teenage girl, is arrested, she’s taken to the police station, searched, fingerprinted and photographed. She’s given a court date; and if the prosecutor proves beyond a reasonable doubt that she committed the crime, she’s convicted. The judge uses his discretion to fit the punishment to the girl’s circumstances. Is she a first time offender? A repeat offender who shows no remorse? And so on. He can impose a penalty ranging from an absolute discharge, to alternative measures like a rehabilitation program or community service, to a fine or jail time. If the girl is lucky and gets a discharge she’ll avoid a criminal record. If not, she’ll be barred from certain jobs and from travelling to certain countries. In other words, shoplifting is a big deal and a teenager just might think twice before swanning into a Shopper’s Drug Mart with her little pals to swipe a tube of lipstick. But the Justice Minister sees the situation differently. Instead of prosecuting these first and second time offenders he wants to put them into “rehabilitation programs”. And there’s the essence of the problem—in order to make his plan work the Justice Minister has to run roughshod over Lady Justice. One: a shopkeeper catches a teenager with a tube of lipstick in her pocket and calls the police. Two: a police officer shows up and needs to figure out whether the girl is an “offender”. This means that the officer must decide whether the girl is guilty of shoplifting and a decision normally made by a judge just fell into the hands of a police officer. Three: the officer must determine whether this is the girl’s first or second “offence”. The only way to be sure that the girl isn’t lying about whether she’s ever done this before is to create a province-wide registry of teenagers who’ve been accused of shoplifting but who have not been charged by the police (no privacy concerns there). Four: After the officer checks the yet-to-be-created registry and determines that this is the girl’s second offence he must decide whether to charge her or let her go. Five: the girl knows that she might be able to sweet-talk the officer into letting her go and does whatever she thinks is necessary to make her case. Six: if the girl talks the officer out of formally charging her with shoplifting the officer will trigger the rehabilitation process and force the girl to attend a rehabilitation program. Seven: this is a “good result” because it “rehabilitates” the girl who knows that she has one more “free pass”. Eight: the shopkeeper’s respect for Alberta’s judicial system knows no bounds (yeah, that was pushing it). What’s really behind the “One Free Crime” plan? The Wildrose argue the PCs are “soft on crime” but I have a more cynical view. The PCs are simply doing what they always do. They’re taking care of corporate Alberta at the expense of everyone else. Last week the doctors got it in the neck. This week it’s the criminal justice system. The PCs have not set aside enough revenue in the provincial budget to pay for the police, prosecutors, courtrooms, administrators and judges, let alone construct the prisons required to handle a population that’s increasing by 100,000 a year. So instead of living up to their Safe Communities promise which stated “It’s time to reinforce existing laws, introduce new ones to tackle pressing issues and make sure the courts are dealing with offenders quickly and appropriately” and developing a long term crime reduction and prevention strategy, the PCs have chosen to tear the criminal justice system apart by decriminalizing “offenses” (until they’ve been committed at least once before) and giving the police and bureaucrats the power to “convict” citizens and send them into rehabilitation. Take another look at Justitia. Her gown is shredded, her scales are bent and her sword is broken. She’s hanging her head in shame. We must protect her. Please write to the Premier, the Justice Minister, the opposition party leaders and your MLA. Tell them that the One Free Crime plan is a travesty of justice and must be stopped. This entry was posted in Crime and Justice, Politics and Government and tagged Johnathan Denis, One Free Crime, Redford, Wildrose. Bookmark the permalink. It seems that there will be no comments this week. Not difficult to figure out why. To make a truethful comment about Justitia in Alberta and in Canada and around the so called ‘Free World’ is for sure going to insult a profession which happens to be the one Susan practices. I too do not want to do that but Democracy and real discussions have a price and many of us have a hard time understanding that. What you describe in your article about Justice is typical of a Government like the one we have now and in general of the ‘More productive’ more ‘efficiencies’ more ‘savings’ less government fat type mentality that has run this planet for the last 3 decades. Everything can be trimmed and everything is inefficient other than their pay cheques and their access to benefits and privileges. This is the mentality that has generated the saying ‘Socialism for the rich and predatorial capitalism for the masses’. Having said that, it is not that complicated to realize that we cannot continue this lifestyle of unlimited medical care for everyone, unlimited resources for Justice, in summary unlimited consumption of everything that we want. I do not think it is hard to understand why. The sissue is that the system is in my opinion affordable if we change it to what it should be and not keep pumping money to feed a class of people. Our so called Justice system to me is nothing but what I call ‘Enrich the lawyers Industry’. A lot of lawyers behave like they deserve to make millions to interpret the law. Yes we do need interpreters. It is like the pope to connect us to GOD type myth. We ignorants cannot understand what real justice means you know. For example, a woman is raped and we for sure know who did it but no way it is going to be that easy. We do not know if she said NO, we do not know if the guy was drunk on and on and on until the lawyer has made enough money to buy a house at the lake. In the end the victim and the real pain is second nature and the real issue is the who is going to win this game. Of course these issues are not just black and white but we have managed to perfect them to absurd levels of pseudo-intelectualism and money making processes that are nothing short of mass retardation. I know that I am not alone in my opinion of the Justice system. I also know that our system is one of the best in the world but that is only because the others do not exist. No wonder then that when the money is not there the system fails. Susan, lawyers are making way too much money compared to us regulars and we are making too much money compared to those who are unfortunate enough to be at the bottom of the barrell where there is very little Health Care, very little protection from the police and no Justice period. In the US for example where they have privatized the prison system, according to reports from The Atlantic magazine and others, any vulnerable person with mental issues or drug abuse or even just homelessness are put in jail so that the expected statistical quotas are met and the company makes great profits. This of course with the help of lawyers and judges that help in the game for large sums under the table. In Canada we always think we are better but I have learned with experience that we are much better at making sure that everything looks good at the surface and so it smells better. My insult stops here despite the fact that I could go on for a while longer. In the subject of immigrants, the story is even better but I do not wish to say more than I think it is appropriate for this discussion. Carlos, I still have faith in the legal profession, but my faith has been shaken to the core by the Justice Minister’s appalling plan to throw the justice system under the bus in order to “save” money. The Justice Minister is still a lawyer and an officer of the court. When some bright light in his department came up with this insane plan he should have rejected it out of hand and if he was “forced” to proceed with the plan by the Premier he should have resigned with a lot of fanfare so we’d all know what he’d been asked to do. Susan unfortunately this is not a unique case in the US. According to the Atlantic the problem is endemic in many states. It is hard to accept that despite the fact that people want to believe that we do not need regulation and that the market blah blah blah, it just does not work. Humans will take advanatage of any situation possible to exploit other defenceless humans or those with less power. Lawyers and Judges, who have high levels of training and who are supposed to be the examples for law and order are involved in these cases all over the US. In Canada the situation is only better because we did not go for privatization the way it happened in the US but we are heading that way. More and more our systems are failing due to encroachment of two much private interest or weak regulation. Harper of course does not care because to him that is what democracy is all about. Our politicians believe in Liberal Democracy that so far is nothing but a free voting system (in some cases) that favores the elites and big corporations. This sounds like a broken record but unfortunately it is true. I try to discuss this with many people and all I get is ‘That is the way it is’. Well not to me. If we claim to be a democratic country we act like one. Absolutely right Carlos. The root of the problem is the characterization of privatization as the panacea for all our ills. Privatization brings in the profit motive which distorts everything. I can’t figure out whether our government is simply incompetent which in turn plays into the hands of those who argue that the private sector could do a better job, or whether the government is intentionally pushing us to privatization by packing the halls of government with brainless bureaucrats who can’t think their way out of a paper bag and do exactly what they’re told as long as they get their bonuses. In either case we need to stay on them–as you said, if we claim to be a democratic country we need to act like one. It really is “anything goes” in Alberta these days. I mean I knew it was this way in the political arena, and that it was spreading to the universities with the interference of the government there, and now I see they are getting into the anti-democratic mode with the decriminalization of first offenses. This is really creepy. If the police don’t like you can they decide to forget about the first crime and prosecute you? Will there be favorites who get off and lesser mortals who won’t? It seems a wild, wild West sort of justice that is coming to Alberta. What with all the myriad other problems in Alberta, I had missed this entire travesty of justice. Money is yapped about as being the reason for these nutty ideas by the Tories but really I don’t agree with this. It is ideology that is responsible for this failure in governance. And it is the fault of citizens that we have this government in power. We are not spending too much on essential public services. We are spending too little. I actually don’t believe that essential public departments such as health and education are fat and need to be trimmed —but rather that such departments are underfunded and poorly managed by the Tories. Certainly I do feel we are spending too much on corporate welfare such as the P3 projects that are already the rage in Alberta where private companies get their hands in the public purse without a great deal of transparency (on the basis of FOIP legislation) and yet seem to profit highly. We are entering a new era of private-public partnerships that promise to significantly weaken the citizen’s ability to determine how well our money is being spent (this problem of transparency is also evident in the recent budget). In my opinion, some cutting would be beneficial but mainly at the top. We have a fat pudding government, with AHS and Education filled with managers who are richly endowed and who do not give us bang for our buck. Why do we have so many managers at AHS? Surely to goodness there should be front line staff rather than all these talking heads? The same sort of nonsense is present in every government department with the spin doctors yapping endlessly about Action Plan type stuff and Synergy propaganda. It’s a bedlam of oil- indoctrination wherever you go in Alberta with the public purse feeding the lie to the ordinary bloke on the street who is clueless about the scam being pulled on him. Most folks are too busy, harassed or trying to make ends meet to even think about politics. Only problem with this state of affairs is that we get the same poorly performing folks in government— election after election. We have to care about politics because if we don’t –soon we won’t have a democracy but some sort of legalized mockery of democracy in Alberta (if we are not there already). It continues at the municipal level. If I look at Edmonton City Council —I note that they have ballooned into a metastatic cancer —-with “sustainable development” departments that feed the urban sprawl created entirely by the developers and their city council buddies. I think the problem is that we have the top of the pyramid at all levels of government—paid excessively well (think of the salaries of these managerial folks at the top) and their salaries never get chopped when resource money is down.This top management seems to be engaged in excesses that we –the people cannot control. Think of the Katz arena as one example. Think of the urban sprawl that has already turned Calgary into some sort of housing hemorrhage and that will soon convert Edmonton from a hick city to a major hick city (all the while bleeding citizens and their kids of tax dollars to ensure that developers get their profits for a boom that I doubt is coming). Right now resource money is down, the government fails to look at multiple streams of income (increase oil royalty rates, return to a progressive tax system, introduce a provincial sales tax) and so we have these idiotic political acts by the Alberta government to deal with the understandable shortfalls of cash. I don’t know why lawyers and doctors are getting blamed for this mess. They earn the salaries they do get. Sure they could be getting less but have you looked at what the MLAs are getting for much less time at school and for much lower levels of job performance? Most of the time I don’t see any value for our politicians and I see a great deal of value for our professionals in medicine, law and education. Have you looked at what oil patch folks are making? Why should doctors and lawyers be blamed for the mess created entirely by the Tories failure to leave right wing ideology and be sensible? Just look at the oil patch executives earning major sums of cash and no one is yapping about the bite they take out of our public purse (they get paid richly while we get the low royalty rates). In fact why does no one even talk about the billions of dollars that oil companies earn that we don’t get because of the Tory ideology of corporate welfare? I think this dumb idea of forgiving first crimes is unacceptable but it is part and parcel of the deliberately created panic mode of government right now. Panic in the sense that there is no real deficit except the one created by the Tories. The Tories create these panics on a regular basis when oil revenues decline to get the populace in a tizzy and in herd shape (heifers and steers are easily stampeded). In my mind there is no need for this sort of slash and burn governance that we have tolerated for forty years and more in Alberta. It’s stupid governance —that results in a disengaged electorate —-that in turn ensures that the Tories stay in power. The fault lies not with the single focus on oil revenues but on the Tories’ deliberate and lazy failure to diversify the economy and ensure multiple streams of revenue for the public purse. The low giveaway price for our non-renewable resources does not help either but should have been expected because of the boom in the USA in terms of shale gas/oil. If there is a massive oversupply of product–you should expect lower demand and a lower return for that product. Any nitwit could see if the oil revenues are down, we don’t have enough money to pay for the same bills–so why not have other sources of income to pay for the bills that we know must be paid–that are of a certain vintage? This dumb act —of refusing to prosecute a first crime—is just another sign of the degradation of democracy in Alberta. The simple underfunding of essential institutions such as the judicial system—will lead to the erosion of the judicial system. and a further demoralization of citizens. We only have the judicial system to believe in now that we can’t depend on our government and once the judicial system slowly trashed in this way, well in my mind–that the erosion of the judiciary is an erosion of democracy. What do we do about it as citizens? I think we need to dissent. More importantly we need to organize and vote these anti-democratic folks out. They really don’t care about the law or democracy and they obviously haven’t bothered about the electorate for decades. I still believe in lawyers but not the lawyers in government. Julie you nailed it at the beginning and the end of your post. It’s our fault that this wretched government has been in power so long and it’s up to us to vote them out. In the meantime we need to voice our dissent at every opportunity through emails and letters to our MLAs, and cabinet ministers (Justice Minister Denis is going to find me dogging his heels at every turn), and letters to the editor, whatever it takes. You mentioned corporate welfare. I like the fact that you extended the definition to include P3 projects and I’d also include government revenue structures like artificially low taxation and royalty formulas that allow companies to deduct too much in the way of upfront expenses. I wonder whether one of the reasons that upgrading in Alberta is deemed to be “uneconomic” by industry is because the royalty/tax structure is much too generous to those who ship out raw crude but too harsh on those who want to upgrade it here. You’ve got to wonder who’s calling the shots here. My underlying concern with this idiotic law is that it gives too much discretion to the police to decide whether an act is illegal. This is a judge’s decision, not a police officer’s decision. There’s absolutely no principled thought to this change, especially when you consider it in the context of the other changes Justice Minister Denis is pushing through. He’s decided to do away with the program that lets petty criminals serve their time on weekends. This program allows them to keep their jobs, continue to work and feed their families and now it’s gone. If you consider these two changes you can’t figure out whether the PC government is “tough on crime” or letting alleged criminals get aways with breaking the law. Makes absolutely no sense.